Following the talk I gave to the year 8s and some work they did with their teachers, here are some of the questions the young people came up with regarding the First World War in Africa. As with all such things, there are some I’m amazed have been asked – I know the point was addressed in the talk and in class. But I’m also aware there was so much new information that sometimes the message is lost. What is rewarding is that they’re asking the questions and some are absolutely brilliant. Thank you. So here are some brief answers for now, others I might come back to later on. What did the Africans do in the war? The short answer is the same as what people in Britain and Europe did. Some men fought. In Africa the idea was that only white men would fight in what was hoped to be a ‘white man’s war’. France recruited black soldiers to fight in Europe – for example from Senegal. However, there were black soldiers such as the West African Frontier Force (today’s Nigeria, Ghana, Sierra Leone and The Gambia). Others worked as porters or carriers and others as labourers. There was much work which had to be done such as clearing away bush for camps, roads, airfields. Cooking and cleaning of camps and hospitals, washing of clothes and so on. It is estimated that there were over 1 million porters alone in East Africa during the war – they were local but also from West Africa, Seychelles, China and Southern Africa. The women carried on looking after the farms and houses, helped with carrying and doing other tasks where they could. How much did the war cost in Africa? We know the figure for Britain’s involvement – £72 million or the equivalent of four years war budget in 1914. What was the population of Africa before and after the war? This is a difficult question to answer and we will never know exactly because there was no accurate data kept and the systems were not developed enough to undertake a census. The size of the countries meant that those living in remote places might never see a government official. Why is Africa not so well known for fighting in the war? Why don’t people remember them as much? How do Africans remember the Africans that have died in the war? Do they at all? The African campaigns were seen as secondary. They had no direct impact on what was happening on the Western Front, which for Britain was the most important theatre. If Britain lost there, it would lose everything in the same way Germany did in 1918. The fighting in Africa was a distraction for those running the war except that the territories could be used as bargaining chips at the peace negotiations if needed. In addition, very few men from Britain fought in Africa compared to in the European theatres and the Dardanelles. Further, there were few reporters and people able to get messages to Europe for publication and when they were able the stories were often too depressing to publish when things were not going too well in Europe. It was therefore decided to keep the stories, unless they were about victories, out of the press to keep the Home Front morale up. When the British men who had fought in Africa got back to Britain, they did not tend to talk about the war because family and friends assumed they had been on holiday and had it easy compared to those in Europe. This was because of the idea of Africa being a place of fun and adventure such as hunting. It was also not as exciting or heroic to tell people that you spent much of your time in hospital or sick because of malaria and other illnesses when they were talking of being shot or caught in a bombardment. For all these reasons the war in Africa was not remembered. For the people in Africa, the war was just another of many wars they were involved in and because life was already a struggle to survive, they carried on doing what they could. It wasn’t their war, they got involved because their masters asked/told them to. There is also a very different way of remembering in Africa to that in Britain. This is due to the mainly oral traditions which are found in Africa rather than a written one. People told stories and eventually the stories disappear because new ones take over. Were there African generals? Why weren’t African soldiers treated the same as European soldiers? Who led the Africans? Who commanded the Africans? There were white African generals such as Jan Smuts and Jaap van Deventer from South Africa who commanded the forces in East Africa after 1916. Although there black, Indian and Arab soldiers fighting in Africa, there were no generals from among them. This was because Britain controlled the Empire and preferred having its own people, who were white, manage things. This was part of the belief at the time that whites were more intelligent and able than people of other backgrounds. The war helped the white imperialists to see that people of colour were as able and intelligent so that in World War 2, there were officers of different races. Some of the leaders of African independence had served during the First World War and learnt from their roles about how to organise and manage people to bring about change. Who looked after the injured Africans? There were Field Ambulances which consisted of stretcher bearers and dressers who collected the injured soldiers from the field. An ambulance in World War 1 was not a vehicle but a group of people. 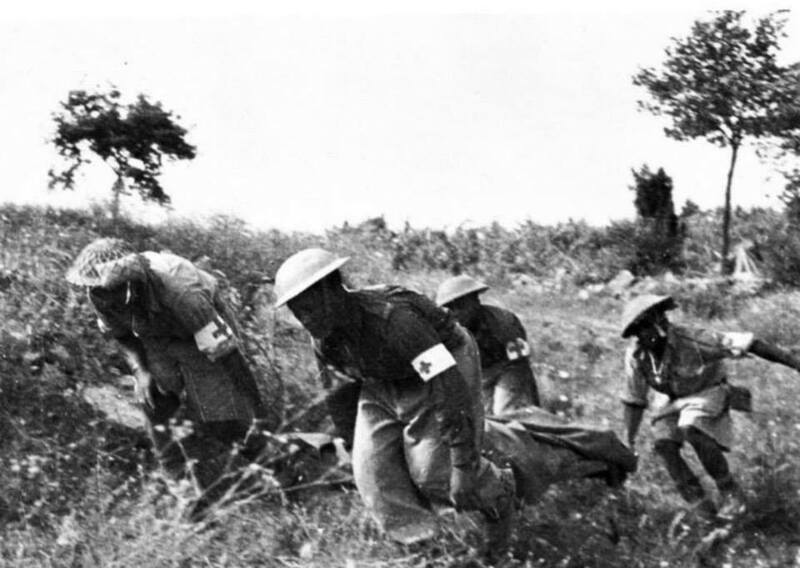 From the front, the injured went to a Clearing Station where it was decided if they needed to go to hospital or be treated on the spot before returning to their regiment. From the Clearing Station they went to Stationary and General Hospitals for more specialised and long term treatment. There were hospitals for Europeans (whites), Black Soldiers (King’s African Rifles) and Carriers. The Pike Report into the medical conditions in East Africa in 1917 noted that the Carrier hospitals were some of the best they had seen which was a great improvement on how the situation was in the early years of the war. For those from other countries such as South Africa and Seychelles, they were sent home on Hospital Ships before going into a hospital at home to recuperate or be sent home. Before a soldier or carrier was discharged for medical reasons they attended a medical board which decided what happened to them and if they received a pension pay out. According to the Medical Boards for the Cape Corps (Coloured or Mixed race force from South Africa) many of them were given three months R&R (rest and recuperation) before being discharged. This allowed them to get an additional three months’ pay without having to do any work. They also received free accommodation and food for those three months. This was one way the white doctors could help people who were discriminated against by law because of their colour and position. Were there any sea battles in Africa? There was only one real ‘sea’ battle in Africa which was on Lake Tanganyika. However, there were a number of naval engagements. In the Indian Ocean, the German cruiser the Konigsberg had disrupted shipping from the start of the war, sinking the first British Merchant ship of the war (carrying tea). The Konigsberg eventually went into hiding in the Rufiji Delta where it took a hunter and aeroplanes to find the ship. Because the delta was so narrow, special monitors had to be sent out from Britain which could navigate the narrow streams to bomb the Konigsberg with help from spotter planes. It is said that the Hedwig von Wissmann was the first German ship to be captured by the British in the war. The Hedwig von Wissmann was on Lake Nyasa at the southern end of Tanzania. It was captured by the Captain of the British boat Gwendolyn. The two captains used to meet every year for a drink when their boats passed each other, so when the Gwendolyn came alongside the Hedwig which was in dry dock being repaired, the German captain didn’t realise he was going to be arrested. The German captain hadn’t been told that war had broken out. On Lake Victoria the British boats were bombarded by the Germans from the coast line as they were trying to transport troops across the lake to Bukoba to participate in a land battle in early 1915. The most famous of the ship encounters were those on Lake Tanganyika where two boats, HMS Mimi and Toutou were transported overland from Cape Town to Lukuga in the Belgian Congo. On 26 December 1915, the boats captured the German boat the Kingani which was renamed HMS Fifi. Not long after the Hermann von Wissmann was sunk. The black stoker from the Kingani survived and continued to serve on Fifi once he had recovered from his injuries. The Germans then sank their newly built ship the Gotzen so that it did not fall into British hands. The Gotzen was later restored and still sails today on the Lake as MV Liemba (the local name for the lake). In West Africa, ships were used to transport troops along the rivers in Cameroon and Togoland. Ships were also used for blockading the coast to prevent German goods from getting to the armed forces. In East Africa, two blockade runners were able to get through and resupply the German forces. Where possible, the British Navy bombed the German radio stations along the coastline. This happened in Dar-es-Salaam (Tanzania) and Luderitzbucht (Namibia). What side was Africa on? Where did the troops come from in Africa? Britain and France had the rest between them, most of West Africa was controlled by France whilst East and Southern Africa was controlled by Britain. Italy had a tiny piece called Jubaland. Neutral Spain had Equatorial Guinea and Fernando Po which accepted German refugees from Cameroon and Togoland. The French used soldiers from their colonies in Europe whilst Britain refused to do so. Was Africa also controlled by European countries in WW2? Yes, most of the continent was controlled by European powers. France, Britain, Belgium, Portugal, Italy and Spain had the main share. It was after World War 2 that African territories fought for their independence. Many of the leaders at independence had either been been alive during WW1 or were born soon after so experienced the devastation of the land and the struggles parents and others had to rebuild their lives. A list of African leaders who were influenced by World War 1 can be found here. What guns did they have? What weapons did they use? There was a mix of guns. The Germans used black smoke guns from 1871, there were machine guns, Mausers and Lee Enfields. Different size canons were used, some having had to be restored as they had been ornaments for many years. The 10 and 6 pound guns from the ships Konigsberg and the Pegasus were converted for land use. Some potentially useful history of the different weapons used throughout WW1 – not just Africa. Who made the materials? How did they get the weapons? Who supplied materials? The materials were made in European factories or in America for the British territories. Most supplies for Africa came from India which was the traditional supplier of material for the armed forces in Africa. South Africa also supplied some material. Very little was made in Africa. The Germans in East Africa experimented with making what they could out of local material rather than relying on imports. Some of the weapons were already in the different countries because of the slave trade and hunting expeditions. Weapons had also come in with the colonial wars and African communities had their own weapons too. During the war, weapons were sent from Europe, America and India. Portugal gave South Africa 10,000 mauser rifles at the start of the war and Malta sent them two canons because South Africa had said the British Imperial Garrison which was in South Africa could leave for the Western Front. They took all their weapons with them which meant the new country (only formed in 1910) and its army (formed 1912) had no weapons of its own. The allies (Britain, France, Portugal, Belgium) had more weapons because they could import them into the African territories. The Germans had to use what they already had in their colonies. In 1918 the Germans replaced their weapons with Portuguese guns they were able to obtain when they invaded Mozambique. How much was a single rifle to make? How much did artillery cost? This will need some research into the budget and treasury files. It doesn’t look as though an historian has written about the specific costs yet. Weapons were also bought in large quantities which would have affected the price. See here for an idea of the number of rifles ordered. Is there an unknown soldier grave in Africa? The South African one is not in South Africa but at the South African cemetery at Delville Wood in France. Are there any statues to African soldiers in England? Yes, there are. One was recently unveiled in Brixton, London. Does Africa have a remembrance day? Today, Africa is a continent made up of 54 different countries. Countries like Rwanda and Burundi only came into being after the First World War (as part of the Versailles peace discussions). Each country has its own remembrance day although most whites across Africa will recognise 11 November. Remembrance Day is a particularly British commemoration. The two minute silence was suggested by a South African, Sir Percy Fitzpatrick, as a way to remember everyone: different religions, those who survived and were damaged by the war, those who died and those who weren’t able to serve for various reasons. What did African women do in the war? How many African soldiers survived the war? What planes did they use? Why are there not many records of Africa during the war? The main issue is that the records are in different places. Depending on who recruited the soldiers and others, determines where the records are kept. In addition to the records at the British National Archive, there are records in Nigeria, Ghana, Uganda, Kenya, Zambia, Zimbabwe, South Africa. The Indian records are at the British Library. Some documents were destroyed during World War 2 when a German bomb fell on the archive. The bits that remain are called the ‘Burnt documents’. The records include men who served in Africa. A lack of infrastructure at the start of the war in 1914 meant that there was poor record keeping. This improved in 1916 when the War Office sent out a staff to East Africa. They kept better records. In West Africa, the officers had better record keeping as they had been working with the system for many years. Some records which were sent back to Britain were destroyed when ships were torpedoed and if there was a supply issue, reports and records could not always be kept. We know there was a shortage because some British letters and records are written on German headed paper. There were not many battles in Africa during World War 1. There were mainly skirmishes. How many landmarks were destroyed in Africa? The answer to this question depends on what you define as a landmark. There were no big buildings as there are in Britain. Houses, factories and radio stations were destroyed along the coast when the naval ships bombarded the areas. Sometimes hospitals were hit accidentally because they happened to be in the path. One soldier complained that ‘the most important building had been destroyed in Dar-es-Salaam’ before the British arrived and that was the brewery. Of more consequence than landmarks, was the number of farms destroyed. This meant that the local people suffered from starvation because little was imported for them. Most imports were to help the war effort. Who ended the war in Africa? There were different endings to the war in Africa. The first German colony to surrender was Togo on 24 August 1914. The German commander realised his men did not stand a chance and decided it was better to end the conflict early. German South West Africa (Namibia) was the second to surrender. This happened on 9 July 1915 after the South African commander and Prime Minister General Louis Botha gave the Germans an ultimatum which the German Governor, Seitz accepted. Most of the German forces in South West Africa had been defeated or captured by this time. Cameroon was the next to fall – in March 1916 after the German forces there had been defeated by a joint British and French attack. In East Africa, the war came to an end because the war in Europe came to an end. When the armistice was agreed in Europe it gave a month’s notice for the instruction to stop fighting to get to the German Commander Paul von Lettow Vorbeck. He eventually got the notice on 13 November (the day they fought a battle) but didn’t believe the Germans had surrendered in Europe. He was eventually convinced on 18 November that the Kaiser had abdicated and Germany had lost. The Germans in Africa, around 3,000 in total officially surrendered on 25 November 1918 in Abercorn, Northern Rhodesia (today Mbala in Zambia). Which country was the strongest in Africa? A tough question to answer. There were different aspects at play in the different theatres which determined how well they coped with the war. For example, in Togoland, the German commander did not see the point in wasting lives to prolong what would be an obvious eventual defeat because he was outnumbered. One could say he was strong in character making this decision so early in the war. In German South West Africa, the German army officers did not want to prolong the war because they too knew it would end in defeat but the Governor, Seitz, insisted they do so to help the German fatherland. In East Africa, it was the other way round where the Governor, Schnee, wanted to protect his people and their economy but the commander, Paul von Lettow Vorbeck refused to listen to him and pushed for the army to override the Governor (who was technically in charge of the army). The stamina of the soldiers could be another way of looking at who was strongest. Nigerian and Ghanaian troops served throughout the war first in West and then East Africa, some white soldiers, and especially doctors from Britain served throughout the war with very little break as did Indian soldiers. The German soldiers (askari) in all the colonies showed lots of stamina too. Ten percent of the force which served with von Lettow Vorbeck surrendered with him at the end. Another factor to consider is the number of local rebellions which broke out during the war in the different colonies. Some of the more well-known rebellions included the Makonde in southern East Africa 1917 (Mozambique and Tanzania), Chilembwe uprising in Nyasaland 1915 (Malawi), and in Nigeria after 1915 there were various rebellions against taxes and other legislation. In 1914 some white South African Afrikaners objected to going to war with Germany in support of Britain. The Senusi in Eritrea and in Egypt also took the opportunity of Britain’s attention being occupied elsewhere to continue their struggle for independence. When did they go in to the war? Officially the different territories went to war when their controlling Imperial power did. This was because of the relationship between the coloniser and the colonised. In reality, each territory entered the war as a result of local conditions. The first shot of the war in Africa was fired on 7 August 1914 in Togoland, the second against Dar-es-Salaam on 8 August. Between 15 and 22 August, German forces in East Africa raided into British East Africa where they occupied British territory (Taveta), Belgian Congo at Kivu, Nyasaland (Malawi) and Portuguese East Africa (Mozambique). In South West Africa the campaign officially stared on 14 September when South Africa sent troops across the German border in response to Germans having been spotted in South African territory in August (there is some dispute over whether this really happened). Is the mud that Dr Samson was talking about still there? The mud comes and goes depending on the rain. It’s the same as in Europe. The challenge with the mud in Africa is the soil. In the clay areas, the rain runs over the soil making it very slippery to walk on. In other areas where there is black cotton soil, the mud becomes very sticky stopping all movement. Vehicles have to be dug and pulled out of it. How did Africa deal with their problems during the war when it was really muddy and they couldn’t move. Life slowed down. This was the time to regroup, try and fix supply lines and move food as best one could. All sides were affected by the rains, but they persisted in carrying on as best they could. An hour’s journey sometimes took eight hours or more to do in the rain. Where did they sleep in the war and how did they stay awake? It depends on where they were and what was available. In the worst cases, the men slept under the stars and if they were lucky had a blanket. Others slept in tents either with or without mosquito nets. Where there were camps, bandas or more permanent wooden and mud houses were built for the men to share. Some soldiers wrote about spending nights in trees to keep away from wild animals. Staying awake was probably easier than falling asleep as the noise of the wild animals kept people awake especially when they weren’t used to the noises. However, lack of food, malaria and walking the long distances meant people were exhausted so slept through everything. One soldier got into trouble because he had rigged tin cans to a wire so that if anybody crossed into the area whilst he was on guard duty (picquet) he would be woken up if he had accidentally fallen asleep. The problem for him was that it was his commanding officer who walked into the cans. When the men were on piquet this was usually for about two hours at a time and in pairs which helped keep them awake. They would also walk around. Talking was difficult/banned because sound carried very easily and they would miss hearing the enemy creep up. What flowers grew in the battlefields of Africa? Local plants grew which varied depending on where you were. In South West Africa it was mainly desert. In northern German East Africa there were lots of thorn trees, in West Africa, there were forests and all through what is known as savanna – large open spaces where grass grows to 6 feet tall. Do poppies grow on African battlefields? Poppies do not grow in Africa. This flower is particular to Europe. What flower symbolises war in Africa? Looking out my window, I’m fascinated at the order in which birds come to the feeder and how they arrange themselves to access food on the ground. There is a definite pecking order and from what I can see, it’s not always the big birds who get preference. I’m currently helping a heritage group with some research into the West African Frontier Force (WAFF) during World War 1* and was struck by correspondence highlighting the differences between the various contingents making up the WAFF – the pecking order persists. The issue of martial race has been discussed by many authors and until recently has been taken as read when selecting micro-nations for military service. The correspondence in @UKNationalarchives CO 445 shows how wide-ranging the pecking order was and the reasons for it. It is quite impossible to replace them at once. I understand that it has not yet been found possible to arm the Canadian Contingent with machine guns. We can of course send a copy of this to WO and ask them what they can do… say [to Gen Dobell­­­] that there is much difficulty and delay in procuring war like stores for Colonies and ask whether he considers the matter urgent. The Canadian Contingent was headed to the Western Front. There was also some question regarding the request for replacement guns as it had been noted that on the outbreak of war there were 51 maxim guns in Nigeria (1 with each of the 34 Companies and 17 in reserve), 14 2.95inch guns (6 with No 1 battery and 4 with No 2 battery and 2 with each reserve battery). (CO 445/34 48111) What had happened to these? The issue of weapons to the Western Front was not a ‘white’ versus ‘black’ issue which could be inferred by Canada getting preference over the WAFF, South Africa sufferened similar shortages of weapons and had to scrounge from Malta, Australia and Portugal (forthcoming publications). What has also been striking about this correspondence is the clear understanding that the CO officials had of the different territories under their control and how this compared with the WO officials who saw no difference between the micro-nationalities comprising East and West Africa. It was nothing to the WO to suggest that King’s African Rifles (KAR) recruits be used to bring the Nigerian and Gold Coast Regiments up to establishment if men could not be found and trained quickly enough in West Africa. (CO 455/37 42406). Another area where differences were seen was in the application of the King’s Regulations for the British Army to the African forces. Officers seconded from the British Army to the WAFF recommended that conditions for serving African rank and file be the same as for those serving in the British Army. Whilst this principle of equality was generally accepted for the WAFF, there were local conditions which had to be taken into account which mitigated against the King’s Regulations – notably the payment of separation allowances to families who had no knowledge of, or need for, money. The above are snippets I extracted from my rapid trawl through the series, anyone wanting to delve more deeply into aspects can see the full catalogue listing for the WAFF during WW1 CO 445 on the GWAA site. * The African Heritage and Education Centre (AHEC) is looking for records and accounts of West Africans who were involved in the war during World War 1 – soldiers, carriers, garrison forces, home front etc. If you are able to help, please get in touch either with Christine or myself. I recently received a copy of Information History of the First World War edited by Z Karvalics, Lazlo (L’Harmattan, 2015) from Marika Sherwood who contributed a chapter – An information ‘black hole’: World War 1 in Africa. This is an interesting (genuinely) collection of articles around the theme of information: How information was transmitted in the field, between the war front and home front, propaganda through the use of photos and posters. Unfortunately the book has been poorly edited – most chapters have been written by non-English writers and most are well-written. However, the introduction and a few others apear to have been translated using something like Google Translate. This makes for difficult reading and reduced clarity of expression especially around abstract topics such as knowledge and information transfer. For someone interested in the areas described above, I encourage you to persevere as the content is stimulating and, was for me, eye-opening. I can only identify the areas I found fascinating from the other chapters as my knowldege of the theatres covered is limited: how the term ‘hate’ differed depending on whether you were a soldier or at home, the origin and impact of the term ‘Hun’, how the same photo was used in different contexts with different titles and the development of technology are the aspects which stand out. As I have a fair knowledge of Marika’s topic, I can say a lot more. As someone who has worked on the African theatres of World War 1 for 18 years now, Marika’s article was both a pleasure and a frustration to read. On the positive side, Marika has tried to reconcile the various numbers given by different researchers of black soldiers and carriers involved in the East and West African campaigns as well as give reason for the lack of information in the press at the time and why it is that we historians cannot agree on the numbers. She also touches on the Boer rebellion of 1914. The areas I found frustrating and which I’ll detail below, might appear ‘picky’ but I think it’s important to raise these in relation to the historiography (history of history) of the theatre and my own learning curve in the hope that it will help other scholars ‘new’ to the World War 1 African fronts consider their approach and assumptions. Marika’s chapter is the case study bringing together concerns from a number of articles, conference papers and reflecting back on my early years of engaging with the war. My biggest concern, brought about by the centenary and increased interest, is the reliance on secondary material, and particularly the internet for compiling accounts of the campaigns. This information, that is secondary source (not internet) was credible and compiled by recognised experts in the field but, as I noted in an article for the 1914-1918 Enclyclopedia, there has been a revolution in information available on the theatres which challenges the previously accepted accounts. It is imperative that historians of all kinds consult primary material as much as possible as so much more has been opened to the public since the 1970s and 1980s. Another frustration is the assumption that the war in Africa was fought along the same lines as that in Europe. It was not – whereas the Western Front was overseen by the War Office, in Africa, the War Office, Colonial Office, India Office and local administrators all had their own agendas concerning the war. The fact that so many departments were involved – based on pre-war responsibilities – has resulted in information being scattered between archives and across different series within archives. To compile accurate numbers is a challenge – who recruited the individual? who paid the individual? in what capacity were they employed? The answers to these questions will determine who created and maintained the records, so military service records in London can be found in WO, CO and ADM files, but one also needs to consult the CWGC for deaths as those who died during the war were not necessarily issued with a medal. For all the African campaigns, the records in London are not enough. Local records need to be consulted especially for the recruitment of labour – there might be mention of labourers in the War Diaries but this is not consistent. Application of World War 2 practices to World War 1 is another common practice. Things had moved on. World War 1 saw a major change from early colonial military practices which evolved further after the war and then changed again as World War 2 approached. The organisation structures imposed during the First World War allowed for closer management of the colonial territories and there was increased mixing between the settled and the settlers. This lead to opportunities being seen and taken by all concerned with the result that local inhabitants were more confident, more Western literate and more politically involved than during World War 1. My final major point concerns using how we see the world today to judge how things were in the past. This is a natural human tendancy but it does an injustice to all those who served (willingly or otherwise). Times were different, so were beliefs and these impacted on actions and decisions of the day. What happened then should be looked at in the context of the day – without judgement. Baring the above in mind, and the limited sources Marika used, it is good to see others grappling with some of the issues of the campaigns in Africa and bringing the little remembered theatre to light. It helps those of us immersed in the theatres to take stock of how the world still sees the campaigns and to realise how much work with primary source material still needs to be done (and published). Walking across the local playing fields on a lovely sunny warm day in Hertfordshire, I kicked off my shoes to experience the freshly cut grass. It made me think of a paper I’d recently read on the carriers in World War Africa where the author was commenting on the carriers not having shoes and that this was a sign of mistreatment. I wonder if it really was. Growing up in South Africa, even in a city, I was barefoot as often as I could be and was even comfortable walking to the shop on the hot tar road shoeless. I couldn’t do it today as my feet are out of practice and too tender. In East Africa today, most people on the Kilimanjaro wear flipflops (with socks and legwarmers in winter). If it wasn’t for the jiggerflea still prevalent, I’m sure bare feet would be preferred – the children definitely prefer no shoes when playing. At first, we were amazed at the flipflops, but they have the best grip on the slippery slopes in virtually all weathers (and it’s my preferred footwear). The Zulu impi trained under Shaka were well used to running across the South African veld bare footed. Although this was 100 years before the First World War, during the Anglo-Zulu War of 1879, the Zulu were still fighting bare foot and photos of the Bambatha rebellion of 1906 suggest no footwear was still ‘part of the uniform’. Walter Dobbertin who served in German East Africa with the Germans during the war, recorded his experiences through photographs (Lettow Vorbeck’s soldiers) A quick perusal of these (also found at the Bundesarchive) shows that some askari wore shoes whilst others were shoeless – including photos from the late 19th century. Pictures taken by Dobbertin of village scenes show that all the civilians were bare footed. This suggests bare feet was natural. If people were not used to wearing shoes and were then expected to wear them because they were now enlisted (willingly or otherwise) in the armed forces (in whatever capacity) with little time for training and getting used to the changed circumstances, new shoes would be far more painful than possibly going without. The urgent mass demand for manpower (including women and children) to undertake war work would have put an incredible strain on the Ordnance Department when the focus was on Europe and getting weapons to that theatre. The pressure on the supply units was great. There are accounts of white soldiers walking around in uniforms which were almost non-existent (Norman Parsons Jewell in On Call gives a graphic account of the state of uniforms at one point in the war as do AW Lloyd’s cartoons). It wasn’t for not caring – the items were just not available in the field and the demands of war meant there were no ships to transport such ‘luxuries’. Another thought which crossed my mind when reflecting on the shoe issue was trench foot. How did that Western Front condition compare with shoeless carriers, askari and soldiers in Africa? My plan isn’t to justify the failure to issue shoes or not, but to challenge how we look at the actions of the past. We cannot look at the past using today’s accepted practices. We need to step back in time to understand the conditions, beliefs and social practices prevalent at that time and in the particular space. Blockade and Jungle (1941, reprint 2003) by Christen P Christensen is the fictionalised story of Nis Kock who served on the German blockade runner the Kronborg which managed to get through to German East Africa in April 1915. There are at least two memoirs published in Danish about Kronborg’s voyage and the crew’s participation in Lettow-Vorbeck’s safaris: Nis Kock’s Sønderjyder vender hjem fra Østafrika (1938) and Anker Nissen’s Sønderjylland Afrika tur retur (1962), and a fictionalized version of Kock’s experiences: the author Christen P. Christensen’s Sønderjyder forsvarer Østafrika 1914-18 (1937). The 1864 war between Denmark and Prussia/Austria, which led to Denmark’s cession of Schleswig and Holstein to Prussia, meant that about 30,000 ‘Danes’ had to fight in the German army in the world war 50 years later. Among these ‘Danish’ conscripts, a handful were picked for an adventurous voyage with a supply ship, cunningly turned into the fake Danish SS Kronborg, bringing supplies to Lettow-Vorbeck’s troops in East Africa and to the German cruiser SMS Königsberg, blockaded by British men of war in the Rufiji river delta in Tanganyika. According to Christensen, who used Nis Kock’s account to write Blockade and Jungle, there were 50 South Jutlanders who fought in German East Africa and another 30 South Jutlanders who formed the crew of the SS Kronborg. Christensen takes us through the recruitment of the men providing some insight into how the German military administration system worked, the precision planning of getting a ship through the British blockade in the North Sea and life of board a blockade runner. Once in East Africa, the ship came under attack from the British cruiser Hyacinth and was sunk, although the crew ensured they’d be able to recover most of the equipment on board. Harry Fecitt gives an overview of the blockade runner’s arrival (as well as that of a later blockade runner, the Marie) while Hans-Martin Somer, a Research Scientist gives an account of the blockade runner in his History of Manza Bay. Nis Kock played an instrumental role in the salvage operation and as there is no longer work for the men on the ocean, they join the land forces – Kock becoming an ammunitions’ expert. Here again, we get some lovely descriptions and insight into how the Germans managed their logistics and how carriers were used (by some). Mention is made that Nis Kock and 450 bearers cleared Morogoro of all ammunition in one day (p140). In addition to this, we get a glimpse into how the German forces were able to use the variety of weapons and ammunition they had to conduct the war and the challenges these posed (p133), including those rescued from the Konigsberg. When, later on, they went to Berlin to get their papers put in order, their welcome has hardly cordial: “Communists and Warmongers!” yelled the “Imperialists” at these men who had fought in East Africa to defend Germany’s last colony. Yes, it is a whole project and one which I started on behalf of GWAA. I don’t think we’ll ever get a complete picture of the numbers who served in the East Africa Campaign, although I think we should for the other African campaigns as they were ‘cleaner’ in terms of force differentiation. The East Africa campaign was ‘messy’ – from a logistical and organisational perspective, if nothing else. In 2014 I attempted to gather the existing information on numbers in one place but wasn’t happy with this as it was confusing and didn’t give a clear overview. @WW1EACampaign has prompted my latest attempt to clarify the position – which I’ve done in the attached. In this approach, I’ve used the map of Africa (you’ll have to stretch the imagination a bit here) and looked at the number of men (and women) each territory supplied. For some, you’ll see there are different numbers provided for the same country which raises the question of how were men counted? At what stage of the war? The German author Boell notes that although there were about 18,000 German forces, they were at their peak in early 1916 with approximately 16,000 in the field. He also has a number of 40,000 KAR which were British forces. However, we don’t know how many of these were recruited from German territory. The KAR position is further complicated from before the outbreak of war as KAR forces from Nyasaland were serving in Uganda and BEA whilst KAR from Uganda could be found in Nyasaland. This situation applies to other forces too, especially as the war dragged on and white soldiers were transferred and commissioned into the KAR from the 2nd Loyal North Lancashires and 25th Royal Fusiliers. The East African Mounted Rifles was an amalgamation of various Scouting bodies and never officially discharged although its members too were absorbed into other contingents. How do you account for men who served in different theatres? How do you work out what nationality (or micro-nationality) people were? How do you account for men who found their own way to a theatre to enlist? Where do you find the records when at least 6 different administrative bodies were involved in managing the campaign with the ability to pay for forces? Let’s start with answering question 4 as this relates directly to @WW1EACampaign’s tweet. In short, whichever administration paid for the force enlisted will hold the records. So, for East Africa, we have lists (in theory) held by Britain’s War Office (Imperial Service Troops such as the South Africans who served in EA) and India Office. Those recruited for purposes of labour would have been through the Colonial Office representatives so British East Africa, the British South Africa Company for the Rhodesias, Nyasaland, South Africa for labour from the Union, Swaziland, Basotholand and Bechuanaland. So far, so good. However, fate has worked against us: During WW2 when London was bombed, the records for most South Africans who served in WW1 were destroyed, as were about 1,000 Indian Office files (those dealing with EA). In addition, we lost some of the East African files when, in 1924 the archive in Nairobi caught fire. So, we are left to rely on what we have available. On the link above, I’ve provided references for some of the Medal lists which are available in Kew. Transcribing all these names onto the spreadsheets takes time so progress will be slow, but the info is available and will in time become more widely so. In addition, there is a fantastic project underway in South Africa where tw researchers are painstakingly capturing all the details on the SANLC attestation cards which they stumbled upon in the SANDF Doc Centre. When I met them on my previous visit to SA, they believed they had every attestation card and were all already able to trace some individuals who had served in GSWA, Europe, EA and then went onto Palestine – all by choice! I can’t wait for this project to be completed. The War Diaries (kept @UKNatArchives) contain some nominal rolls – incuding gun carriers, special porters and camp followers. This is hit and miss – as is the general quality of the War Diary – as it depended on the meticulousness of the recorder and presumably the challenges they faced in the field. This means that the recording of casual labour is less likely to be recorded as is comandeered labour – this is the position facing us particularly with regards German and Portuguese records.The other challenge is getting into the local National African archives to see what they hold and hoping that the records are in a usable state (record preservation doesn’t address housing, health and education issues which have greater priority for governments). There is much more to be said – and at least another 3 questions to answer, but this post is already long enough and I think/hope gives an overview of what is available which for various reasons hasn’t before made it into the public domain. With all the technology we have today, one feels ‘On Call’ 24/7 unless one purposefully switches off – pretty much as I did this past weekend. However, there are still professions where people are ‘On Call’ outside of ‘normal’ (what is ‘normal’ these days?) working hours. Plumbers, road side assistants and police are some of those who remain ‘On Call’ as do nurses, paramedics and doctors. All are unsung heroes. And it’s around a doctor ‘On Call’ that leads me to write today. At the end of last week, a parcel arrived containing some copies of On Call in Africa in war and peace 1910-1932 by Dr Norman Parsons Jewell. This parcel marked the culmination of over a year’s work getting to know Norman Jewell; and what an honour. Norman led an extraordinary life. He left for the Seychelles in 1910 serving in the Colonial Services as a doctor and where his soon to be wife, Sydney, joined him. With a young family, he asked to enlist in the armed forces and found himself in East Africa during December 1914. He remained in East Africa save for a few trips ‘home’ to Ireland (Bloody Sunday 1920) and the UK before being made redundant as a result of the 1932 austerity measures. But perhaps the highlight for me was the discovery at #UKNatArchives of the war diaries of 3EAFA written in Norman’s own hand. A study of the War Diaries involving Norman provide an interesting insight into diary and record keeping of the time. Norman did not keep (or the diaries were not retained) during the time that Norman reported into Temple-Harris of Seventeen Letters to Tatham fame (available), while there are two concurrent diaries maintained by Norman at the time he was in charge of 3EAFA and acting Senior Medical Officer in Lindi following South African Dr Laurie Girdwood’s capture by the Germans. Another outstanding feature of Norman’s memoir and war diaries is his recognition of others, especially Zorawar Singh, and the work they did, as well as the importance of friendship. He met many of the Legion of Frontiersmen and following his move back to London, remained in touch with many he had befriended in Africa. His memoir is more than ‘just’ a military account, it opens a window onto colonial life in the early part of the Twentieth Century, while his post-war work introduces us to the challenges the medical world faced in the tropics and busveld. And, in keeping with his time, he protected his family – there is little mention of them in the memoir. BUT, they are not ignored in On Call – Part 3 of the book pays tribute to Norman’s wife Sydney – a remarkable woman in her own right: if only she had kept a diary! Skin colour is irrelevant in a foxhole!